Yezzer has been working all hours on something, but wasn’t allowed to tell me anything about it. Now that Alice has spilled the beans over at Wonderland and Kotaku are all over it I can finally check it out… and it certainly explains a few things! 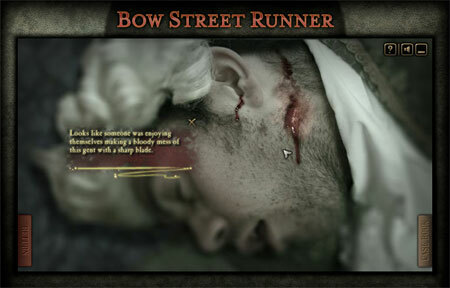 Created to accompany the Channel 4 TV drama City of Vice around the beginnings of the police force in Georgian London, Bow Street Runner is a Flash-based game reminiscent of those point-and click “multi-media adventure games” like Return to Zork in the 90s. Except that it’s actually good (and on a web page instead of 5 CD-ROMs). :-o that’s me! on the interwebs!